Our highly anticipated 2018 Fall Workshop was successfully held on Saturday, September 29, 2018 at University of California, Santa Barbara (UCSB), with the theme of Enhancing Collaborations among Researchers and Institutions. Dr. Baijun Tian from JPL/Caltech, the current COAA SCC president, started the workshop with a report on the COAA SCC executive committee member changes, the COAA SCC activities during the past year and planned future COAA SCC activities. In particular, Dr. Tian formally welcomed students and scholars from UCSB joining our COAA SCC family and thanked them for hosting this workshop. Dr. Hui Su from JPL/Caltech then talked about the JPL Strategic University Research Partnership (SURP), the JPL Center for Academic Partnerships (CAP), and the JPL Researchers on Campus (JROC) followed by Dr. Yu Gu from UCLA introducing the UCLA Joint Institute for Regional Earth System Science and Engineering (JIFRESSE). Then around 40 scientists and students from several COAA SCC institutions (UCSB, UA, UCLA, JPL, Caltech, and UCI) briefly presented their own research interests/projects/results. Many interesting and lively Q/As and discussions occurred during these presentations. The workshop agenda and photos can be found on the COAA SCC website. 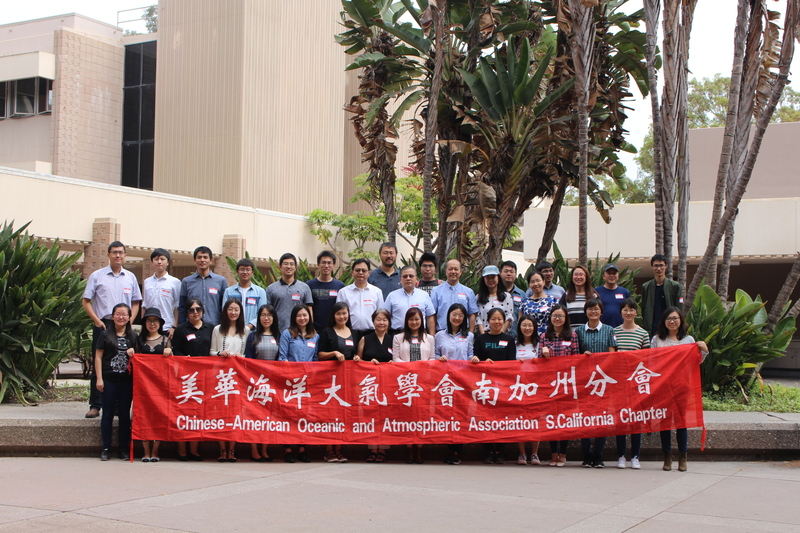 The Chinese American Oceanic and Atmospheric Association (COAA) is a non-profit organization founded in 1993 to facilitate networking among oceanic and atmospheric professionals, promote interests and professional excellence, and provide technical exchange and career opportunities. The PIESAT, LLC (PIESAT) is a high-tech enterprise founded in 2008, focusing on remote sensing and meteorology/marine research and application. Its business services cover oceanic and atmospheric sciences, cartographic, land survey, resource/environmental monitoring, disaster monitoring. PIESAT led the design and development of Fengyun satellites operational systems such as FY3 Satellite Monitoring Analysis Remote-sensing Toolkit (SMART) and FY4 Satellite Weather Application Platform (SWAP) 2.0, etc. It also undertakes many projects on data analysis, weather forecast, climate analysis and applications for provincial and municipal meteorological and ocean bureaus. Besides, PIESAT also founded weather/ocean service center, which provides meteorological information services for road, aviation, electricity, and insurance, etc. Facing the rapid evolution of satellite remote sensing and meteorology/marine application service market in China and abroad, PIESAT, under the leadership of Dr. Yuxiang Wang, has devoted to innovative technology development and superior software management. PIESAT is becoming a top provider of satellite remote sensing and meteorology/marine services in the world with its steady growth of core capabilities and strong competitiveness. Climate change and environmental pollution are major issues of global concern. To raise the attention of the public to the environmental issues, nurture interests of students in oceanic and atmospheric sciences and attract young talents to join the force, COAA and PIESAT proudly launch the 3rd Yuxiang Young Scholar Award in 2018. The award aims to recognize outstanding Chinese and Chinese-American young scholars in oceanic and atmospheric sciences and related fields. It also provides financial support and career opportunities for the awardees in order to promote further development of oceanic and atmospheric sciences and related fields. Scholars of 35 years old or younger, or within five years of obtaining Ph.D., with outstanding academic achievement and innovative research in the fields including but not limited to: Meteorology, Atmospheric Sciences, Space Sciences, Oceanic Sciences, Satellite Remote Sensing, and Hydrology. Each person can apply three times but can be awarded only once. Depending on the number of applications and qualifications, up to 5 awards of $2000 each will be issued in 2018. (1) Applicants submit all application materials before the deadline: August 31, 2018. (2) A committee consisting of experts in the relevant fields reviews the applications. Qualified candidates may be invited for interviews if necessary. (3) Final winners will be determined after the interviews. Selection results will be announced in mid-October, 2018. Please submit the applications to COAASCC.EC@gmail.com before the deadline. Our annual COAA-SCC Fall Workshop was successfully held on Saturday, November 4, 2017 at University of Southern California. The theme of this year’s workshop was Frontiers of Earth, Atmospheric, and Oceanic Sciences. It featured a number of invited talks at the forefront of Earth, atmospheric and oceanic sciences. The five invited speakers provided their perspectives on the current and future research directions of their field and offer advice to young scientists on career development. Particularly, we were excited to have students and scholars from the University of Arizona join our COAA-SCC family in this fall workshop. The workshop agenda, photos, and invited presentation slides can be found in the links below. Please stay tuned for the COAA-SCC future activities. The Chinese American Oceanic and Atmospheric Association (COAA) is a non-profit organization founded in 1993 to facilitate networking among oceanic and atmospheric professionals, promote interests and professional excellence, and provide technical exchange and career opportunities. The PIESAT, LLC (PIESAT) is a high-tech enterprise founded in 2008, focusing on satellite remote sensing and navigation technology, research and application. Its business services cover cartographic, land survey, mining exploration, oceanic and atmospheric sciences, resource/environmental monitoring, disaster monitoring, and national security. Facing the rapid evolution of satellite remote sensing application service market in China and abroad, PIESAT, under the leadership of Dr. Yuxiang Wang, has devoted to innovative technology development and superior software management. PIESAT is becoming a top provider of satellite remote sensing services in the world with its steady growth of core capabilities and strong competitiveness. Climate change and environmental pollution are major issues of global concern. To raise the attention of the public to the environmental issues, nurture interests of students in oceanic and atmospheric sciences and attract young talents to join the force, COAA and PIESAT proudly launch the 2nd Yuxiang Young Scholar Award in 2017. The award aims to recognize outstanding Chinese and Chinese-American young scholars in oceanic and atmospheric sciences and related fields. It also provides financial support and career opportunities for the awardees in order to promote further development of oceanic and atmospheric sciences and related fields. Scholars of 35 years old or younger, or within five years of obtaining Ph.D., who currently study or work in the United States and have lived in the United States for more than 1 year, with outstanding academic achievement and innovative research in the fields including but not limited to: Meteorology, Atmospheric Sciences, Space Sciences, Oceanic Sciences, Satellite Remote Sensing, and Hydrology. Each person can apply three times but can be awarded only once. Depending on the number of applications and qualifications, up to 4 awards of $2500 each will be issued in 2017. (1) Applicants submit all application materials before the deadline: June 30, 2017. (3) Selection results will be announced in mid-September. Hope everyone had a great time last Saturday at Caltech. Below are the presentation slides from four speakers: Prof. Shang-Ping Xie, Dr. Yuxiang Wang, Dr. Jonathan Jiang and Dr. Yu Gu. We thank Drs. Guang Zhang (UCSD), Yang Chen (UCI), Xuan Ji (UCLA), and Qiong Zhang (Caltech) for their dedicated and passionate service for the community in the past years! We also thank all the COAA SCC members who have cast your vote and supported our COAA SCC.